Your son has been feeling down lately. He got a poor grade on a math test, and has been going around saying that he will never get a good job. And that he doesn’t have a brain in his head. You try to tell him that he is very smart. He is incredibly intelligent. One grade does not make or break who he is. You scoured the world over for a role model for your son. You looked at cartoons, and songs. You looked at movies, and found The Wonderful Wizard of Oz. You found the Scarecrow, and you had your son watch it, then he asked to read the books. And he really got into the Scarecrow who had no brain. The Scarecrow who became King of Oz. This Kid's Scarecrow Costume will just further prove to your son that he does not lack intelligence. Like the Scarecrow that he will become when he puts on this green shirt, and flannel hood, he is just too young to have vast amounts of knowledge. He can brandish his paper diploma around as proof of his smarts, and one day he will be heralded as one of the wisest people ever to live. 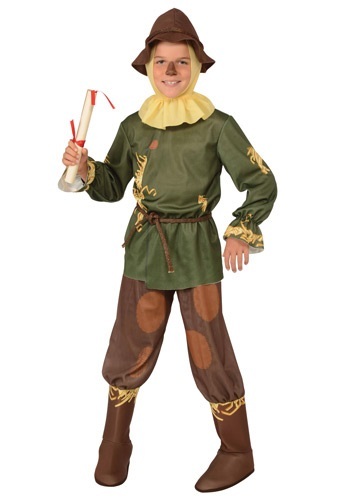 Who knows your son might even become the King of Oz while wearing this costume.